The Proform 720 is one of Proform's best treadmills in terms of cushioning. But just like most of their machines, it is made from cheap parts. So don’t expect it to be problem-free for long. This model would fit those who love to walk or jog. It’s made from cheap parts and offers short warranty that’s why running on it is highly not recommended. If you feel like this model is not what you're looking for, I suggest you visit our best buy treadmills page and choose the best treadmill for you. This treadmill’s best asset is its cushioning. It boasts a ProShox™ Cushioning, which lessens the risk of joint, ankle and knee injuries. Without all these harmful impacts, you'll have a smoother and safer run. As an alternative, you might want to visit our best treadmill page to look for similar treadmills that we recommend. The Proform 720 treadmill comes with a 2.5 HP motor with speeds of up to 10mph to provide you a more challenging workout. However, due to its lack of quality, I don't recommend you maximize this machine's capabilities. The QuickSpeed™ and Quick Incline™ buttons changes your speed or incline with a simple push of a button...allowing you to easily adjust the intensity of your workouts. The 8 custom programs designed by a personal trainer are there to help you reach your desired results. Plus, its iFIT® compatibility adds an entire library of highly-focused and effective workouts. EKG™ Grip Pulse System (Chest Pulse Optional) lets you keep track of your heart rate. This enables you to workout in your target heart rate zone for a more efficient exercise. The cool air fan adds workout comfort by keeping you cool even during your most intense workouts. With it, you'll have more energy for long, grueling workouts. The SpaceSaver® Fold Away Design allows you to fold-up the treadmill after use so it doesn’t take up extra room. This feature is perfect for those with limited spaces at home. As I’ve mentioned above, this treadmill’s biggest fallback is its quality. It is made from cheap parts and comes with short warranties, so putting aside some money for future repairs is a must. 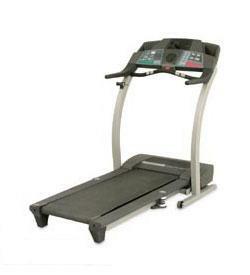 Due to its low quality I wouldn’t recommend the Proform 720 treadmill. I believe that there are other treadmills out there with better quality in the same price range. See our best buy treadmills section. If even after this review you still plan on buying a Proform 720 treadmill, I suggest you buy it at Proform.com. They offer the cheapest price around the net. You can get it for just $799.99.